The Incoming page continues to evolve. Many new titles were added last week, and additional details and links were added for many more. I've also added a button (left) that will take you straight to the Incoming page. Please visit the page regularly, and use the affiliated links to support this site! Note: clicking on any highlighted title will take you to the disc's Incoming entry. 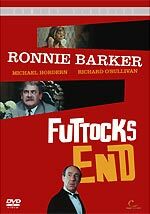 I have some good news and some bad news for fans of the 1969 Ronnie Barker comedy Futtocks End (which is being released on DVD on June the 26th). The good news is that the film is accompanied by a commentary track, which wasn't mentioned on the original press release. The track, by producer / director Bob Kellett, is a good one, offering plenty of useful information. The bad news is that the transfer leaves a bit to be desired, despite apparently having been "digitally restored". It's probably from a 16mm source, and a rather dupey-looking one at that, with soft image, inconsistent black levels, and blotchy colours. I dare say it's looked far worse. It's still definitely worth a punt if you're a Barker or Michael Horden fan (The Tomorrow People's Sammie Winmill and Richard O'Sullivan also feature). Menu screens from the disc can be seen here. Tartan Video will release Robert Greenwald's documentary Wal-Mart - High Cost of Low Price on July the 24th. The film is about the dubious policies of the world's largest supermarket chain (which owns Asda in the UK) on July the 24th. The disc will feature a Tartan-exclusive interview with the director; additional interviews with staff; and extra scenes. The film will be presented in anamorphic widescreen format, with Dolby Digital 2.0 audio. The RRP is £19.99. Sony Pictures Home Entertainment will release the recent remake of John Carpenter's ghost story The Fog on June the 26th. The film, which stars Smallville's Tom Welling, Hellboy's Selma Blair and Lost's Maggie Grace, will be presented in anamorphic 2.35:1 format, with Dolby Digital 5.1 audio, and English HoH subtitles. Bonus features include a director's commentary track (by Rupert Wainwright); Whiteout Conditions - Remaking a Horror Classic featurette; Seeing Through The Fog Making of... documentary); Feeling The Effects of the Fog (special effects featurette); deleted scenes with optional commentary. This list comes from Sony's trade website, and is more detailed than those being used by most etailers. The RRP is £19.99. Sony Pictures Home Entertainment will release the Oscar-winning biopic Capote on July the 3rd. The film, which stars Philip Seymour Hoffman as writer Truman Capote, and Catherine Keener as his friend, Perry Smith, will be presented in anamorphic 2.35:1 format, with Dolby Digital 5.1 audio, and English HoH subtitles. The film focuses on the period when Capote was writing his masterpiece, In Cold Blood. 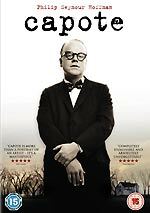 The disc features "commentaries" (with Philip Seymour Hoffman, director Bennett Miller and cinematographer Adam Kimmel); a documentary about Capote; and a two-part Making Capote featurette. The RRP is £19.99. A box set, which pairs Capote with Richard Brooks' superb 1967 film adaptation of In Cold Blood, will also be available, with an RRP of £24.99. 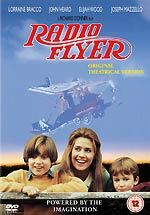 Richard Donner's popular 1992 film Radio Flyer will be released by Sony Pictures Home Entertainment on July the 10th. The film, about brothers (The Lord of the Rings' Elijah Wood and Jurassic Park's Joseph Mazzello who attempt to escape their unhappy family life by constructing a working airplane, also stars The Sopranos' Lorainne Braco, John Heard and Tom Hanks. The disc is billed as featuring the "Original Theatrical Version". The original 1993 home video version was cut by the BBFC by two seconds, and got a PG certificate. There's no record at the Board to indicate that an uncut version has been passed for the DVD release, but the new sleeve art (shown here) sports a 12-certificate, so the disc might be the uncut version. (there's no record of a UK theatrical certificate being issued - it doesn't look like it had a theatrical release here). The film will be presented in anamorphic 2.35:1 format, with Dolby Digital 3.0 audio (left, right and mono surround) and English HoH subtitles. The RRP is £12.99. The Coen Brothers-produced screwball black comedy Romance & Cigarettes, which was directed by Coens fave John Turturro, will be released on DVD by Icon Home Entertainment on July the 17th. The film stars The Sopranos' James Gandolfini, Kate Winslet and Susan Sarandon, and features Christopher Walkern, Steve Buscemi, Eddie Izzard and Mandy Moore in supporting roles. The film will be presented in 2.4:1 widescreen format, with Dolby Digital 5.1 audio. No RRP was announced, but it's believed to be £16.99.